Marcus’s words resonated deeply with me. That’s because, long before content marketing came of age, I watched it help a David Seattle retailer slay its Goliath competitors and go on to an $87 million buyout and a nationwide presence. Although the internet was not available when the story takes place, the 7-step content marketing plan that worked then can still work today for you and your clients. When I was recruited from Boston to Seattle to be Magnolia Hi-Fi’s advertising manager, it had recently transitioned from a neighborhood greeting card and photography store into an audio specialty store. I was the store’s third non-family employee. My responsibilities included helping the store deal with the price competition that’s always been a big part of consumer electronics retailing and develop a foundation for a solid, profitable marketing plan. It was a blank slate. The store was doing little or no advertising, other than occasional advertisements in a free local neighborhood weekly newspaper. Here’s the content marketing plan that changed everything. The advertised products were loss leaders; something to get prospects into the store where they would regularly be switched from the bait to more expensive alternatives, accompanied by whatever else was needed to complete a music system. Endless competition. No matter how low you price an item, there’s always someone who will undercut your price. Price competition is especially dangerous when you’re a David competing with well-funded Goliaths. Incompatibility. Price competition involves a basic disconnect; stores are advertising parts, but most customers need ready-to-use solutions; i.e., complete music systems ready to hook up and enjoy. Lack of story. Focusing on price doesn’t engage buyers, beyond the urge to “put one over on the store” (an unlikely scenario). There are no emotional hooks, no word-of-mouth stories for readers to pass along to their friends. Ultimately, we committed to “system selling,” creating a few, key systems — or pre-chosen combinations of components at popular price points; i.e., $399, $499, $599, $999 (in ’70s and ’80s dollars). This preliminary merchandising gave us something to talk about — topics for relevant educational stories we could tell over and over again… stories that got stronger and stronger with each retelling. Have you identified the core topics for your content marketing? There were very few marketing platforms suitable or available in pre-internet marketing for educating prospects and telling stories. Space: Our 8-page, tabloid-sized (11 by 17 inch) inserts provided space to tell how to buy a quality sound system and space to show why each of our core systems represented the best values at their price points. Low cost per unit: We printed the inserts on newsprint using black plus a second highlight color. By preparing the inserts well before deadlines, we were able to negotiate even lower prices for printing during times when the presses were not being used. Long life: Although we created our buyer’s guides as newspaper inserts, it soon became apparent that they were equally valuable as in-store handouts. Because they weren’t tied to specific promotions, we could hand them out for months after their first appearance. Today, of course, blogs provide the perfect content marketing platform: lots of space to tell a complete story and — thanks to search engines — long life. Do you have a hub in place for distributing your message? What should you look for when buying a receiver? Should you buy a single-play turntable or a record changer? How do you compare speakers? How do you hook up a stereo? What kinds of accessories can enhance your listening pleasure? We used approximately 30 percent of the space in each issue to talk about our “core” systems and why they offered such great value. We used the remaining 10 percent of space to describe our store’s philosophy and how we backed up what we sold. Are you educating your prospects to shop for value rather than savings? We used a professional graphic design firm to produce not only our buyer’s guides, but also in-store signage and our weekly newspaper ads (even though newspapers will usually lay out ads free of charge). The benefits of professional design soon became obvious, in terms of consistency, recognition, and easy reading. Beyond quality, the investment paid additional long-term benefits. For example, after the first buyer’s guide, we based subsequent issues on the same template, reducing costs. As we grew, we were able to amortize design and production costs over multiple newspapers. Do you view quality design as a long-term investment? Just like today’s content-filled blogs need consistent promotion from Twitter and other social media tools, we supported our buyer’s guides with an aggressive, multimedia marketing program. Print media: Rather than allowing our ads to “float” throughout each Sunday newspaper, we committed to a location where our weekly ads would be found by those looking for our competitor’s ads. Since the dominant player, at the time, had a contract for the center spread of the Times Sunday TV Section, we purchased Page 5 — the first right-hand page in the TV listings with advertising. Each ad invited customers to our store to pick up a copy of our latest insert. Broadcast media: We promoted our buyer’s guides at the end of each of our radio ads. We also primed the market before each buyer’s guide came out, and saturated the airways the day each insert appeared. Special events: To reinforce our authoritative, content-based image, we held frequent seminars and workshops inviting the leading names in audio and video to present at our store, during our Meet the Inventors series. Image-building: Occasionally, we purchased ads in regional editions of national publications, such as Time, Newsweek, and Sports Illustrated. After the ads ran, we purchased laminated reprints to display in our stores. Are you nurturing your content hub by sending traffic to it from other sources? Broader distribution: Originally, we only inserted our buyer’s guides in newspapers delivered within our immediate area. As sales increased, we added additional residential areas of the city, before expanding to the key suburbs, then going for full regional distribution (which reduced per-copy costs even more). Bigger ads: Our original newspaper contract was based on the minimum size that would dominate a page and prevent other advertisers from appearing on “our page.” Soon, however, we upgraded to the full page, before adding Page 4 — the facing page. Broadcast frequency: Our original broadcast schedules targeted key listening blocks (like morning and afternoon drive-time). As our resources improved, we didn’t buy more stations, but we did buy more time throughout the day on the stations where we were already known. Is your content marketing plan scalable to accommodate growth? A successful content marketing program requires more than creativity and quality production; it also requires strong and dedicated management. From the start, we spent a lot of effort internally, selling our content marketing plan to our sales staff and keeping them informed about upcoming advertisements and promotions. A commissioned sales force responds with Pavlovian speed to competing prices. In the early days, we often heard comments like, “They’re killing us! Why aren’t we fighting back?” In fact, sales and profit margins were increasing, and — soon — we were killing them. But, it was not always smooth sailing. Over time, this became less and less of an issue as the buyer’s guides became increasingly popular and the store’s quality image grew. Soon, the best sales candidates in the area — and beyond — were approaching us looking for jobs. Are you and your staff taking a long-term view of your content marketing? Within 18 months, our original small store in an out-of-the-way neighborhood was joined by a huge store in Seattle’s high-traffic University district, two blocks from a major Interstate 5 exit. This was quickly followed by two more stores in fast-growing, high-traffic retail locations south and east of Seattle. Expansion then took place throughout Washington and in Oregon and California. In 2000, the father-son partnership sold Magnolia to Best Buy for $87 million. 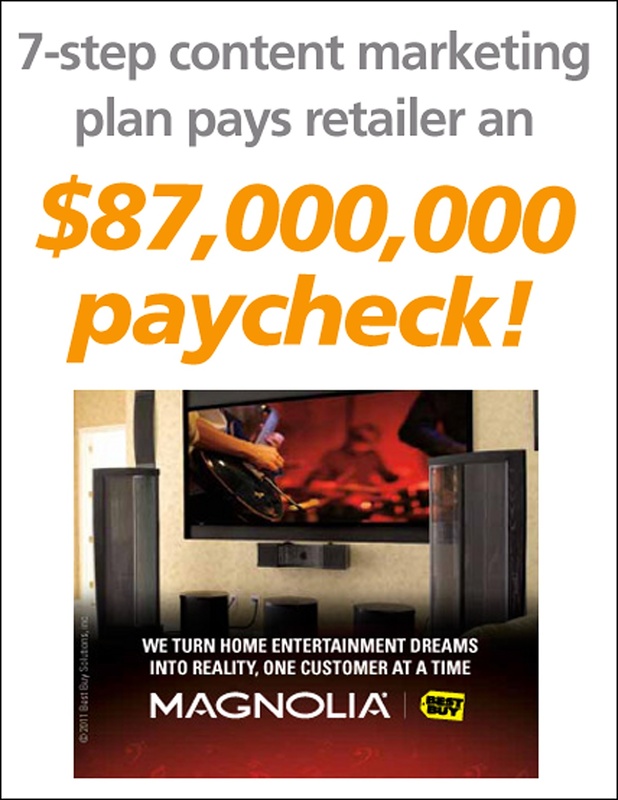 Now, there are more than 350 Magnolia Home Theater locations in Best Buy stores throughout the United States. Content marketing not only helped Magnolia go national, but the same principles also helped me develop a national following. I left the store after its second doubling in size, and I began to write a monthly marketing and advertising column for a leading consumer electronics trade publication. In exchange, I was given a monthly advertisement to promote my modular “do-it-yourself” newspaper insert templates. I created them for retailers to complete on their own, with the help of their local newspaper or printer. I offered several versions; i.e., back-to-school, tax refund, graduations, car stereo, etc. In each case, all of the heavy lifting — the design and editorial content — was complete. All dealers had to do was insert their core systems in the designated locations, along with their logo, locations, and financing options. Coincidentally, the first retailer to purchase my original Holiday Buying Guide was Richard M. Schulze, the owner of a Minneapolis store… who later founded Best Buy! Looking for more content marketing case studies? Download our ultimate eBook with 100 content marketing examples.